Just in case you haven’t heard, the quality of your sleep may actually be just as important to your health as diet and exercise. You’ll need about 7 to 9 hours of sleep a night to get sufficient rest. So to make that possible, you’ll need the right bed, the right mattress, the right pillows, and the right sheets and blankets. But sometimes that’s not enough. Before you start going crazy figuring out what to change or what combination of mattress and pillows to try out, maybe you should try to get a mattress pad instead. The best mattress pads will really improve your quality of sleep in ways you never thought possible. Isn’t technology great? In a way, finding the right mattress pad is like buying a mattress. You need to check the thread count, because a pad with a higher thread count will be better able to keep the fill in while it keeps the dirt out. Then of course you need the right size. You should measure your mattress before you start shopping for a pad, so that you know the dimensions you need. There is also the matter of how the pad is attached to your mattress. Anchor. This is when the mattress pad has elastic bands just on the corners of the pad. This can help attach your mattress pad to your mattress, but this is the least secure attachment method. Fitted. The pad will resemble a fitted sheet. The top is typically quilted. You also have elastic bands on the corners, the top, and the sides. Wrap. This is the steadiest and most secure attachment style of them all. The elastic goes around fully: the top, the sides, and the bottom. Even the sides are quilted too, so that it really stays in its place. One way of doing this is to just read as many mattress pads reviews you can find online. There are plenty to be found, believe me. Some are obvious product placements, while others are so unreasonably negative that they don’t make sense at all. Typically, the best mattress pad review will cover the cost, the features, and the durability of the mattress pad. But everything depends on what you want the mattress pad for. Protection against normal wear and tear. If this is your primary objective, then you just need something basic. A regular cotton mattress pad will do. Protect against spills. If you like to drink stuff while you’re on your bed, then you may want a mattress pad with waterproof features. That should save you a lot of trouble when you line to drink juice or coffee in bed. You’re worried about bedbugs. If this is true, then you may want to use boiling water to get rid of the bedbugs from your mattress. Or you can even have a professional cleaner take a look at it. But that’s not an option if you like staying in cheap motels, and if that’s the case you can always bring a mattress pad with you which comes with bedbug barriers. Preventing allergic reactions. There are actually some mattress pads with antiallergenic features. You want to feel warmer or cooler. If so, then a mattress pad can be an effective measure making you feel comfy about the temperature. A cooling mattress pad, for example, will use up less than 100W of energy, unlike an air conditioner which can guzzle up to 900W. 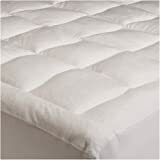 It may also be about the material used for the mattress pad, and natural fibers like cotton and wool can really help. You want more support, or firmness. You can use latex or a memory foam mattress pads. The memory foam gets soft where you press on the pad, so it stays firmer elsewhere. You can also a cotton mattress pad with a lower fill count. You may also want to try an egg crate mattress pad, which offers a dimpled support that helps prevent bed sores. An egg crate foam mattress pad is also called a convoluted mattress pad, and it looks like an egg crate or the surface of a golf ball. You want your bed to be softer. Hard bed mattresses can really feel like you’re sleeping on wooden furniture, and again the memory foam mattress pad can really help. You may also want to try a therapeutic mattress pad specifically designed to help people feel better and avoid aches and pains. You may also want to look at pillow top mattress pads, which are designed to have the look and feel of a pillow top. They have more filling for your comfort. You don’t want to be disturbed whenever your partner moves in their sleep. More than a hundred years ago, having separate sleeping beds for a husband and wife were quite common. Now modern couples have to endure sleep disruptions whenever their bed partner turns over. Fortunately, that can be minimized with a memory foam mattress pad. For this, what you want is something that has everything you need. They have the features which makes you comfortable and relaxed when you’re in bed. They should also be very durable. Finally, they have to be super affordable. That’s where the Pinzon Basics Overfilled Ultra Soft Microplush Queen Mattress Pad comes in. But the main problem here is that you really need to either have it washed by a pro or just have it dry cleaned. It’s huge and really fluffy, and your washer and dryer won’t be able to handle it. You can choose among several sizes, and all of them offer ultimate comfort while also protecting your mattress from wear and tear. These pads offered the best bang for the back, as the price is really low. On the cold winter months, your blanket won’t be able to help you get warm. If you want to save on energy costs, then a heated mattress pad is your best bet. You need something way more than just a pad that’s merely comfy. You need something that can really make you feel warm throughout. 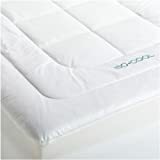 The Soft Heat Micro-Plush Top Low-Voltage Electric Heated Queen Mattress Pad, White is a great example of what you need. For one, it is extremely plush and soft while offering ample support. It’s even every easy to wash and dry, and it won’t stretch or shrink when you wash it. But it’s the heating elements which really takes the cake. Other pads use really bulky wires to heat the pad, but here you have wires that are super thin so you don’t feel them at all. The wires are spread out efficiently so that you don’t have cold or hot spots that can make you feel distinctly uncomfortable. If you’re worried about safety, you shouldn’t. It’s very safe. It uses low voltage tech, and it has over-temperature protection. It even shuts off automatically after 10 hours of continuous use. And, here’s the best part: it has two separate zones so that you and your partner don’t have to compromise on what temperature to sleep on. Each zone has its own adjustment controls, so if you are feeling warm while your partner is feeling cold, each one can be accommodated. There’s a dial you can use so you can really be exact in the temperature you want, unlike some pads which has just low medium, and high settings. And finally, despite all these marvelously hi-tech features, it’s still very affordable, as its price is even lower than many of its competitors. As for the cons, some who admitted to having super-sensitive hearing may hear some high-frequency noise, but even if you are one of these rare types of people you can get used to that. After, all, it’s using power, and that can’t be helped. So you’re off to college, huh? Congratulations. Don’t let the thought of the high tuition fees give you sleepless nights. You have more immediate things to worry about, such as doing well in your studies and making new friends. A lot of scientific studies show that too many young students today can’t get enough sleep, and that can really screw up your grades. So if you have to sleep in a dorm, you may want to buy some ear buds and an eye mask. Of course, you should also invest in a good mattress pad. You don’t want to think about how that mattress in your dorm bed has been used by previous students. Also, a lot of these mattresses can be really hard on your body. What you need is something that’s really comfy, and at the same time it should also be affordable. You want something that’s durable, and which can also protect the mattress it’s on. The temperature it offers should be good enough for both warm and cold seasons. And it should protect against allergens and dust mites. While this list may seem impossibly long, it’s actually possible to get a pad with all these features and with a very affordable price tag. Check out the Sleep Innovations 2-Inch Memory Foam Twin XL Mattress Topper if you don’t believe me. This uses memory foam, so there are no unusual pressure points that can cause you to toss and turn, and your spine gets all the support it needs. It gives you that feeling of being cuddled as you fall asleep. Yet this memory foam is much better, because it does not retain heat. That helps feel cool during the warm season. The airflow is much better so, you get a cool night’s sleep when you need it. It’s also very durable. Advanced foam technology has been used here, so the recovery is much better as well as the durability. It’s actually made in the good ol’ US of A, so you know that proper quality control measures have been taken. It is also resistant to allergens and dust mite, so that’s covered. Now if you still can’t get good grades, you have bigger problems than just an inadequate mattress. If you’re looking at pillow top pads, then softness must really be your most important factor. The thing with pillow tops, however, is that it offers an extra layer of softness, but it can be too soft. That’s what makes the Iso Cool Memory Foam Mattress Pad with Outlast Cover, Queen really unique. Yes, it’s a memory foam mattress pad, but there’s an additional layer in the form of the Outlast Cover. The cover helps make you feel cool, which can be a problem with memory foam. And the memory foam and the extra layer combination can really work wonders in making you feel really comfortable. If you have any aches and pains when you sleep or when you wake up, then this is really what you need for a pain-free nigh of sleep. Even the cost is amazingly low, which really makes the value for money soar. You don’t need a new memory foam mattress—this memory foam mattress pad will be more than sufficient. So there you have it! All these candidates are extremely affordable, while their features are quite impressive. Now you just need to figure out why you really want a memory foam mattress pad so you can choose the right product for you. This entry was posted in Mattress Pads, Mattresses, Sleep well on July 17, 2014 by admin.